What’s up with the new 1890s? Portlandia nailed it with the “Dream of the 1890s” sketch last year. Except the ‘90s are not just alive and well in Portland, but also Brooklyn and a hundred hipster enclaves in between. Keeping chickens in the backyard and wearing Bible beards has even bled into the ‘burbs, surely suggesting that their cool factor is approaching its sell by date. And in related news, trendwatchers tell us that steampunk—the late 19th century inspired mashup of retro, sci fi, and post-apocalyptic style—is about to go big. By big they mean mainstream: forget Etsy, try Target. Pickling, knitting, cheese making, and beer brewing can all be explained as a search for authenticity. But alienation is not exactly new. “It’s a long way back and this modern world has gone off the track. But you can escape it all in Portland.” The clue here is when Carrie Brownstein shimmies into the “Dream of the 1890s” as a flapper and gets re-styled. This ain’t the 1920s. That was so 2006: remember, before the bubble burst? The 1890s were a little darker. The Homestead Strike, Coxey’s War, the Panic of 1893, the Pullman Strike, the McKinley assassination, the start of the first overseas counterinsurgency in the Philippines. And let’s not forget the one percent. It’s not for nothing that economists and political scientists keep reminding us that it really is the Gilded Age all over again. Corporations have their human rights back; the plutocracy is eclipsing the meritocracy. It’s all very Elbert Hubbard. Who? The original 1890s rebel, that’s who. Hubbard was a boy from the country who became a traveling salesman and then a corporate wunderkind (Hubbard innovated direct mail advertising). But the stresses and strains of the Gilded Age troubled him and he sold out his shares of the Larkin Soap Company to set himself up as a writer. After that, he did the coolest thing ever by today’s standards: he went to and then dropped out of Harvard. He finally found his way when he started a utopian craft community, the Roycroft. 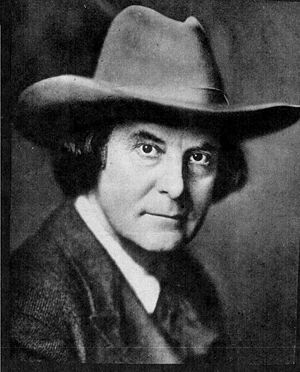 Hubbard affected a personal style that stood out in his day, with long flowing hair and a hat from an earlier decade. He wrote that, “to wear a hat just like everybody else is to acknowledge that your head thinks the same thoughts that all other heads think. To wear a hat long out of fashion…is to throw down the gauntlet to the bourgeoisie.” And so Hubbard and his followers wore their outdated fashions and lived as artisans making fine furniture and hand-printed books. The funny thing is that Hubbard never did stop wanting to make it big. He’d been inspired by William Morris’s uncompromising principles about handcrafted quality, but made sure to sell his Roycroft products at accessible price points by cutting corners where necessary. He endlessly promoted himself as an outsider even as he went on tour as a lecturer for increasingly large fees. And if he skewered the pretensions of the cultural elites in his ‘zines (that is, self-published chapbooks and literary journals), as his career went on, he wrote ever more admiring hagiographies of the one percenters of his day. In 1912, he wrote the original paean to the wealthy men of the Titanic who gave their lives so that women and children might live. Some of that text turned out to be eerily prescient, as he and his wife would go down on the Lusitania in 1915. It is often said that the sinking of the Titanic marked the end of the Gilded Age, but maybe the dream of the 1890s ended with the death of conflicted hipster huckster Hubbard on that other boat, the one sunk not by an iceberg but by an explosion. Though this doesn’t necessarily have anything to do with the causes of its “resurgence,” I see another parallel between the current age and the 1890’s — the dizzying pace of technological progress. In the way that the late 19th century and early 20th was a bit of an age of wonders (electricity, cars, AIRPLANES! ), so too has been the past decade or two and possibly the next few. Having all of the world’s information suddenly in the palm of your hand is a bit like being able to one day pick up a handset and talk to someone miles away when the day before you could only write letters. For sure – there’s probably the same kind of sense of wonder and simultaneous uneasiness about the rate of technological change that would explain an interest in anachronism.